Now back to this week's king cake! I'm sure that some of my fellow Louisianan's may be flinching that their favorite cinnamon-y dessert is getting stuffed with apples and goat cheese. Blasphemy right? When I brought up the idea of picking up one of these bad boys on my way home from school, she texted me, "Sounds gross but if you want it for the blog..." Yeah, I won that decision. I'm going to lie, even though I have received many different tips about how good this king cake was, I was a bit hesitant to make the purchase. 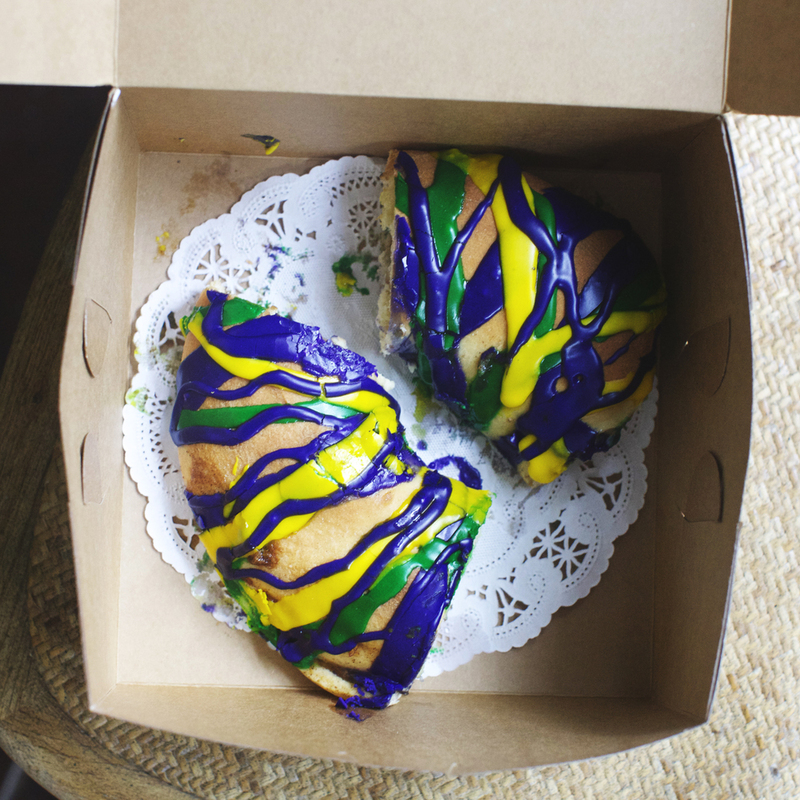 With only one week left before Mardi Gras Day and the death of king cake season (*tear*), I swallowed my fear and made a detour from my commute to Steve Himlefarb's Marigny outpost, Cake Cafe. Great decision. When I took my first bite, any bit of uneasiness immediately left my body. Their cake was perfectly sweet and the filling — oh my. I don't like goat cheese, but this combination just worked. That familiar slight tang of chevre that I despise was lessened by the sweetness of the apples throughout. My only qualm is that it could of been just a tad moister. Definitely worth the try! Photo by Lulun & Kame. Cake Cafe offers a selection of king cakes, including the famed apple & goat cheese, raspberry cream cheese, traditional, and straight up cream cheese. Cake Cafe is located in the Marigny at 2440 Chartres St.